It's hard to escape the holiday season taking over all five of our senses. I tend to ignore all the hype until after Halloween. I like to savor each holiday in order. Well, Halloween has come and gone and we are well into November. I guess it's time to acknowledge the fact that Thanksgiving is a little over two weeks away and I haven't even started my Christmas shopping. Breathe, Shanna, breathe. It dawned on me, after I put it on, that this outfit I wore for date night last Friday would be a perfect holiday party style. Isn't it funny how subconsciously my mind was probably thinking holiday fun, but consciously focused on trying to get dressed up for a night out with Ross. This time of year can play serious tricks on our minds. This mix of patterns, textures and fabrics would be great for an upcoming holiday event. The metallic pants from Wallis have just the right amount of subtle glam for an evening out. Add a red wool trench coat to stay warm and polished. Layer on a few statement pieces, your favorite pair of heels heels and you are set. Luckily, we only have a few dressy holiday obligations this year. I can almost bet that this outfit will be on repeat at some point in the next month. It will be one less thing to stress about, plan for or purchase. Gotta love my subconscious mind helping me prepare in advance for the crazy weeks ahead. Top to toe gorgeous - that red coat is totally festive!!! This is a perfect look for a holiday outfit. Gorgeous! this coat is stunning. Absolutely gorgeous look Shanna! Those metallic pants are ah-mazing! I love this look. STUNNING! Now I need a red coat. Fantastic coat Shanna! And the whole look is gorgeous. These pants look amazing on you, I love the metallic sheen! And I so want a red coat, this one looks fabulous on you! Gorgeous! Love that red!! Those pants are fabulous, I cannot pull those off. And seriously, I am usually half-way through my list for the holidays and this year I haven't even started. Eek! You look SO good in red! But those pants are what really caught my eye - gorgeous!! Yes, prefect for the holidays! Great coat! this outfit is just so fun and fancy!! i love the pants! and red is your color! You look gorgeous! 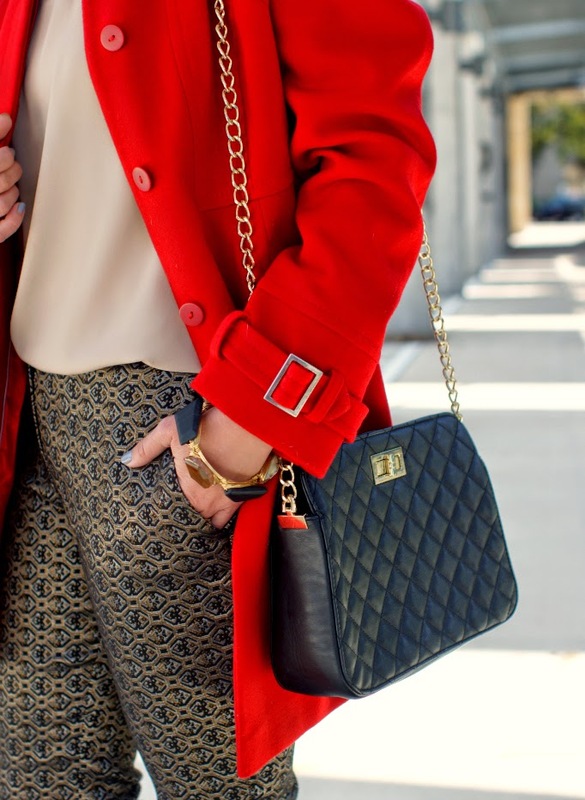 In love with those pants with the red coat! So fab! This is the perfect holiday outfit! Love the pants and your necklace! Gorgeous! You look gorgeous in red! Those pants are perfect for the holidays. I guess it is time we started accepting it... after all Christmas isn't that far away. Yikes!? So festive! I love the red jacket and your necklace! Also, what brand is your nail polish? You should wear those pants every day! You look so cute in them wish my figure was as kind to skinny pants as yours is! Look so great! This is so cute! Perfect for work around the holidays! No winter wardrobe can be complete without a bright red wool coat! I have a fire engine red one from 2 seasons ago and want a really tomato red for this year! JCrew had a good one but I'll wait for the sales to start;-) LOL! BTW, you are a hot babe in red! Hope you are having a wonderful day! Such a sleek and sophisticated look on you, Shanna! I can't get enough of those jacquard pants! Perfect for this time of year! As usual, you nailed it! Those pants are PERFECT for holiday parties that will be coming up soon! I need to get my hands on some similar to this! This outfit couldn't be more perfect for embracing the holiday season! Stunning! The color of the coat is so pretty! and I like the you style it, very chic! Oh my! I am obsessed with this look Shanna!! 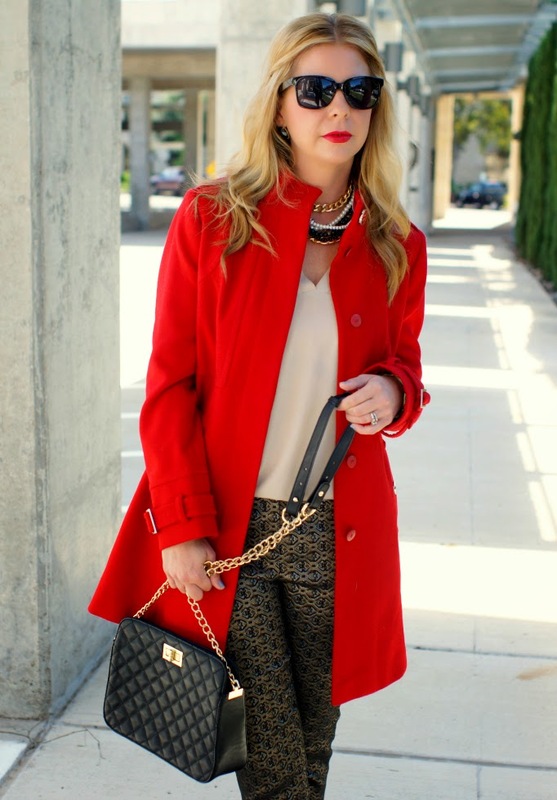 Those pants are show-stoppers and they look perfect with the bright red wool coat. This really is the perfect Holiday look! OH my gosh, this whole outfit is swoon worthy! Love, love, love that jacket! You look stunning in this coat! 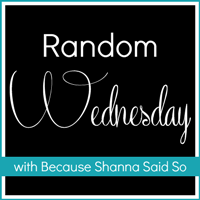 Love it, Shanna! OMG Shanna! This is absolutely FAB! You nailed it and I totally want to recreate this look for the holidays! This would definitely be perfect for a holiday party, I love the pants! Yes this would be so gorgeous for a holiday party! I cannot even believe Thanksgiving is in two weeks. Gosh I need to start my shopping! Love this look! That coat is everything. Late to the party but here I am!! You look fabulous! Love the red coat with those sparkly pants! Yes - so holiday perfect!!! Oh I love the red coat! What a statement it is! It is especially lovely with the brocade pants. Thanks for the great Holiday ideas, Shanna! you look amazing in red! love those cute pants! the print is fantastic! Gorgeous as always! I love love love the color of this coat on you! In love with those pants. Beautiful outfit. Those pants look so amazing! I'd had my eye on them, but I'm never sure how pants are going to fit so I played it safe with a sweater. They are going to be the perfect holiday piece for when you aren't in the mood to throw on a dress. Shanna you look stunning as usual. What a gorgeous look, and in love with the pants and that coat, OMG it is just perfect! The holidays are coming and you are ready!! Wearing fun pants is a great idea, especially with the cold temps! this red coat is super chic!! I am loving it paired with those pants!